All roads lead to Rome…. and all solar technologies lead to Soltigua! This was the discovery of Botswana delegation who visited Soltigua on June 8th. The visit was the opportunity to introduce Soltigua’s leading edge solar concentrating technologies for solar process heat to Executive Member of Botswana Solar Industries Association Karen Giffard of Sosolar, who came accompanied by Ms. Elizabeth Chavolla, Senior Investment Promotion Expert of UNIDO ITPO ITALY for Botswana. 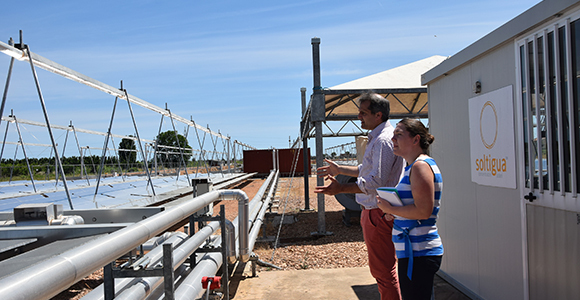 Both parabolic trough and linear Fresnel collector technologies were shown and explained in detail to Ms. Giffard by Francesco Orioli, Soltigua’s sales director, who highlighted the pros and cons of each one for the potential applications available in Botswana and mentioned by Ms. Giffard such as abattoirs, breweries and the like. The visit covered also the iTracker, the new PV solar tracker developed by Soltigua, which can enhance the annual performance of PV modules by up to 30%. “Such meetings are at the heart of UNIDO’s mission – concluded Ms Chavolla – and we hope and believe that they will contribute to a rapid large scale development of solar technologies in Botswana”.